"Far West boy feeds a swan" in Taronga Park Zoo, Sydney. January 2, 1935. Photo by Ted Hood from the State Library of New South Wales. 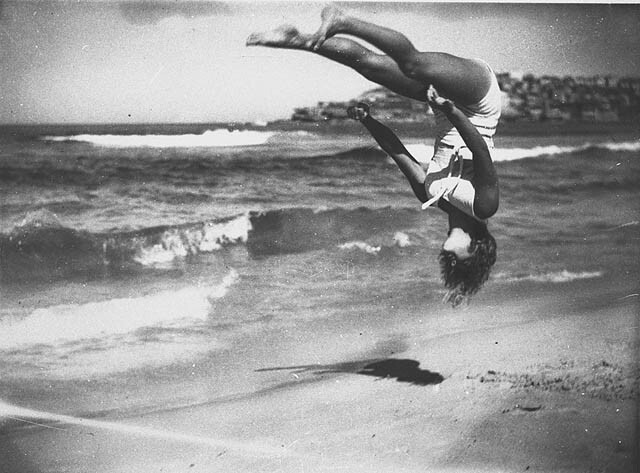 Taken at Bondi Beach, Sydney, 6/2/1937 by Ted Hood. Format: Film photonegative (copied from original nitrate photonegative) from the State Library of New South Wales. Taken Sydney, 1930s, by Sam Hood. Attributions: Possibly John M. Hendry, bodybuilder and physical culture writer. Taken at Bondi Beach, Jan 1935, from the State Library of New South Wales. Notes: Taken by Ted Hood who was employed by his father at that time, for use in the news pages of the Labor Daily for which Sam Hood contracted a news coverage.